Outer wall is manufactured from Heavy Duty 24- Gauge Satin Coat Black Steel. Perfectly Round, Perfect fit pipe to pipe with the use of Olympia's Smooth-Weld™ and precision end forming technology. "I compared Ventis Double Wall with our old "top choice" DuraVent DVL and Ventis WINS hands down! With the comparable 40' to 68" Telescoping sections, Ventis weighs a whopping 4 lbs more than the DuraVent DVL!. When sliding the telescoping pieces together, the Ventis has not made a scratch yet, but every time I have installed DuraVent DVL slips and telescoping sections, I always had to touchup the paint for the scratches that were made. 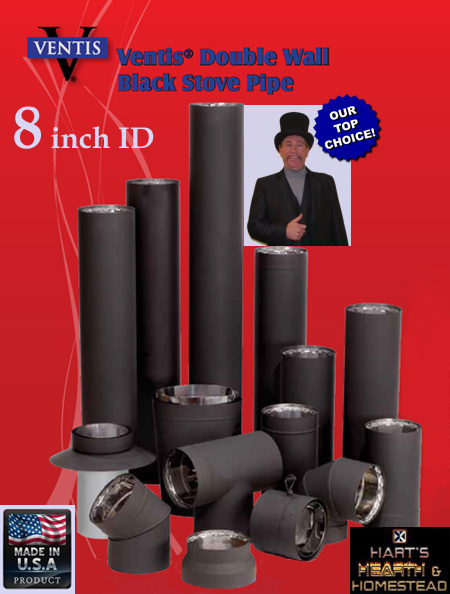 So many more positives to this pipe..........Ventis Double Wall Stovepipe IS our TOP CHOICE now!" Alan Hart, President, Hart's Hearth Inc.